General George C. Marshall, U.S. Army chief of staff, prepared his nation’s land forces to go to war. On July 17, 1941, United States Army Chief of Staff General George C. Marshall sat before the Senate Military Affairs Committee. As with previous appearances by this career soldier, the senators were impressed by the blue-eyed, sandy-haired, 58-year-old general who had served as the Army’s head man for almost two years. General Marshall projected strength and a gravitas that demanded the respect of all who knew him. In France during World War I, Marshall served as the American Expeditionary Force’s (AEF) assistant chief of staff, earning praise from AEF commander General John J. Pershing for his efficiency. After the war, Marshall served as an army instructor at service schools, the staff college, and twice with the National Guard. In the summer of 1939, President Franklin D. Roosevelt chose Marshall over many senior officers to lead the U.S. Army in its most challenging hour. Indeed, FDR made the Virginia Military Institute graduate the point man in the administration’s military dealings with Congress. Marshall’s mission on this hot, muggy summer day less than five months before Pearl Harbor was to impress upon the committee the necessity of extending the service time for America’s citizen-soldiers, the majority of the newly expanded two million-man army. After the fall of France in June 1940, the United States launched a massive effort to bolster the national defense. For the first time in American history, young men were drafted in peacetime for military service. The draft law required the selectees to serve one year on active duty. The first selectees entered service in November 1940; Marshall had a few months before they would go home. Since the previous summer, Marshall had tapped half the Reserve Officer Corps’ 100,000 members for one year of service. He hoped Congress would extend these mostly junior grade officers who were spread throughout the Army. But most important to the new army’s growth were the National Guard divisions called into federal service beginning in the fall of 1940. By the summer of 1941, Guardsmen constituted close to two-thirds of General Marshall’s army. The first four of the 18 Guard infantry divisions would complete their one year of service in September and go home unless Congress extended their active duty. The chief of staff tried to impress upon the senators in Washington, D.C, the dangers of the world situation. The Axis might turn west through Spain, Portugal, the Canary Islands, and West Africa, menacing the Americas. Highlighting Marshall’s fears was that day’s New York Times top headline: “Nazis Approach Smolensk On Road To Moscow.” The Wehrmacht seemed poised to dispose of Hitler’s Soviet enemy, an event that would allow him to turn west. The same newspaper page announced the fall of another government cabinet in Tokyo. The Japanese militarists were working their will. General George Catlett Marshall assumed the office of acting chief of staff on July 1, 1939. Marshall was promoted to the rank of full general at his official swearing in as chief of staff on September 1, 1939. In an emergency or a declaration of war, the Guard would be federalized, the reserve divisions filled with reserve officers, volunteers, and, if necessary, draftees. Furthermore, the law mandated the Regular Army to provide not only officers and noncommissioned officers for training new men in both the reserve and Guard divisions, but also to create a small but immediate expeditionary force. The General Staff assumed this three-component system could conceivably create a 2.3 million-man army after two months of relentless mobilization. Postwar realities quickly transformed this plan to create an inexpensive but trained defense force of professional and citizen soldiers into inflated rhetoric. The reduced congressional appropriations of June 1922 signaled the Army’s long slide from the promise of the postwar years to the poverty of the Great Depression. The Regular Army had to reduce the officer corps to 12,000 and the enlisted strength to 125,000, thus preventing the Regulars from carrying out the Defense Act‘s dual mission “to provide a field force to cover the mobilization of the citizen components … to provide troops for training in various specialized schools and training centers in the nine Corps Areas.” Faced with these cuts, the General Staff scrapped the training centers. By the mid-1930s, a decade and a half of neglect had taken a heavy toll. Many Regular units shrank to shells of their intended strength; some units existed solely on paper. The two National Guard divisions in each of the nine corps areas provided the only encouragement. Although not at full peace strength, the National Guard divisions hovered closer to the ideal than did most Regular divisions. The dramatic events of 1937-1938, from the sinking of the U.S. Navy gunboat Panay in China to the Munich crisis in Europe, convinced President Roosevelt of the vital necessity to rearm. At a November 14, 1938, White House meeting of the president’s military and civilian advisers all but the generals were shocked at the Army’s weakness compared to those of the dictatorships. While the November meeting did more for the Army’s semiautonomous air force than it did for the ground force, the meeting did result in the creation of the Protective Mobilization Plan (PMP). The plan’s core consisted of the Initial Protective Force (IPF), four Regular infantry divisions, 18 Guard infantry divisions, various headquarters troops, reserves, and 400,000 volunteers. The dangerous reliance on the volunteer soldier ideal continued, but at least a mobilization blueprint existed. The Army‘s 20-year slumber had ended. One week after the Nazi invasion of Poland, President Roosevelt issued Executive Order 2352 on September 8, 1939, declaring a limited national emergency and authorizing a modest 17,000-man Regular Army increase, bringing the total to 227,000. The president also authorized National Guard expansion to its full peacetime strength and extended the reserve officers’ active duty. FDR told Marshall these steps were as far as he dared go without creating extreme reaction from the public. Thus, the president demonstrated that politics and public opinion influenced these decisions from the outset. Nevertheless, everyone within the military welcomed any reinforcements. Earlier that summer, Maj. Gen. Hugh A. Drum took his First Army into the field for maneuvers. Drum called the Army a “collection” of understrength and underequipped individual units with little cohesion. Of the nine authorized Regular Army infantry divisions, only the first three and part of the fourth mustered enough troops to take the field, and these divisions were at less than full peacetime strength. Fortunately, all nine authorized divisions were World War I “square divisions” of four regiments per division, totaling 20,000 men. Since most of the world’s armies had converted to the more mobile triangular divisions, the War Department followed suit and reduced each division’s manpower requirements by one-fourth. The president’s manpower authorizations allowed the Guard, constituting 75 percent of the nation’s ground forces, to recruit 126,000 men to reach 235,000—still short of the 450,000 allowed by the Defense Act. Unlike the Regular Army, the Guard could not easily detach regiments and move them to other divisions because of its state and regional nature. Understanding the political and geographic nightmare of triangulating the Guard divisions and fearing what Marshall described as “the confusion of organization” and animosity within the Guard, the War Department spared Guard divisions from triangulation during the pre-Pearl Harbor defense period. The third component of the defensive triad, the Organized Reserves (OR), was barely organized. The original Enlisted Reserve Corps withered away from lack of membership, leaving only the Regular Army Reserve (RAR) as a source of trained enlisted reserves. Early in a limited emergency, Marshall felt disinclined to call up these men. RAR membership included 25,000 recently enlisted veterans with at least one Regular Army enlistment. Thanks to the nation’s 365 college ROTC programs, the Officer Reserve Corps (ORC) boasted almost 105,000 men. These young officers played a key role in Marshall’s national defense army. During the winter of 1939-1940, while Europe’s Western Front settled into the “Sitzkreig,” the chief of staff and the War Department agonized over the necessary manpower and equipment. A delicate balancing act, this situation required congressional compliance. Therefore, Marshall went before the House Appropriations Committee on February 23, 1940, and warned, “If Europe blazes in the late spring or summer we must put our house in order before the sparks reach the Western Hemisphere.” Marshall warned that a hasty expansion could “fatally dilute” the trained troops and outrun the already meager equipment and supplies. Yet, he feared “waiting until a major crisis developed and then attempting the impossible.” The chief of staff needed to proceed at a measured pace. 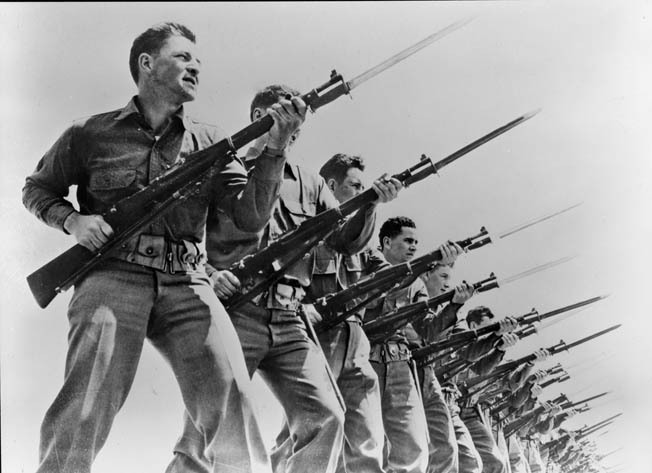 In this staged photo, U.S. Army draftees pose during bayonet drills as the pace of training exercises picks up in 1940. Throughout the mobilization’s early stage, material emerged as a top priority. The Army needed munitions, weapons, and vehicles to create the IPF, yet procurement time stretched from one to two years. Quick action was needed, but many in Congress failed to appreciate the dangers of the hour. One congressman complained that for eight years he had listened to the Army beg for more money. The congressman asked Marshall why the army could not say, “Here is our program, and this is what we think it is going to cost.” Marshall could only reply that conditions change. On May 10, 1940, conditions in Europe did change. On that day, the Nazi blitzkrieg swept through Belgium, Luxembourg, and the Netherlands. Within four days the Germans crossed into France and broke through the French lines at Sedan. President Roosevelt quickly reacted to what he called a “hurricane of events” by traveling to Capitol Hill on May 16. The president asked Congress for $1.1 billion in supplemental military appropriations, $732 million for the Army, thus allowing an increase in Regular Army personnel to 255,000 and enough material to equip a million-man IPF force. That evening, at the suggestion of Secretary of the Treasury Henry Morgenthau, FDR designated General Marshall as the administration’s official spokesman on military matters. Morgenthau believed Republican Congressmen would find it easier to vote increases requested by the Army’s chief of staff, rather than requests from the president or his war secretary. Marshall refused to mobilize the Guard until necessary. The Guard represented the chief of staff’s main reserve, and he feared an early call-up. If the Guard prematurely mobilized and the European war dragged on without American entry, Marshall might have to send the Guard home, a disruption in the Guardsmen’s lives and a waste of time and money. Because Guard unit efficiency required active-duty training, Marshall believed it more judicious to increase the Regular Army and train it properly; the Regulars would then act as an advantage to the mobilizing Guard rather than an equally understrength organization. All troop increases were to come from voluntary enlistments. To fill the Regular Army’s ranks, the War Plans Division (WPD) devised the Civilian Volunteer Effort. Launched nationwide in early 1940, this high-pressure recruiting drive with newspaper ads, billboards, and radio spots was expected to enlist 90,000 men within a month’s time. Considering the Army’s 1939 monthly average enlistments totaled 8,000 men, the War Department’s faith in the plan proved impractical. With a large-scale mobilization or possible war looming, conscription emerged as the only viable option. The original 1920 Defense Act contained no military draft. By 1926, however, with the ERC underfunded and virtually empty, Congress authorized a draft to fill the 27 OR divisions and a model bill to submit to Congress. As a result, during the winter of 1940, the War Department possessed a draft plan but lacked a declaration of war, fearing that even the mere mention of conscription might derail the Army’s appropriations before Congress. The president’s political position further complicated the situation. Roosevelt hoped to receive a spontaneous draft for an unprecedented third term at the Democratic Convention in Chicago on July 15. Conscription was not in FDR’s political lexicon. With neither the chief executive nor the War Department prepared to suggest a draft, the Army’s manpower procurement situation floundered. Surprisingly, the impetus for selective service came from the civilian sector. In May, the Military Training Camp Association (MTCA), the World War I civilian preparedness movement, held its 25th reunion. Most members had reached prominent positions in American society, and they viewed the international situation as dangerous to American security. The MTCA’s executive committee leaders, prestigious New York lawyer Granville Clark; Brig. Gen. John McCauley Palmer, father of the 1920 Defense Act; and Adolph Ochs Adler, general manager and vice president of the New York Times, adopted a resolution on May 22 calling for a selective service law. The next day, General Palmer visited his old friend General Marshall. Acting as an MTCA official, Palmer asked for and received both the model conscription bill created in 1926 and the loan of Major Lewis B. Hershey and three other officers to whip the bill into shape. In that last week of May, Marshall still opposed a large-scale mobilization. Yet, the chief of staff favored a politically acceptable draft bill in case the European war worsened. Timing was critical. Conscription enacted too soon would spread the veteran troops too thin for proper training. Conscription enacted too late might invite attack, resulting in chaotic mass inductions. Undecided, Marshall awaited events that were quick in coming. On May 27, Belgium surrendered, the British began the Dunkirk evacuation, and the French Army retreated. Now the scope of the European disaster began to register on the American consciousness. On May 31, President Roosevelt asked Congress for standby legislative authority “to call into active service such portion of the National Guard as may be deemed necessary to maintain our position of neutrality and to safeguard the National Defense….” Authority for calling up the ORC accompanied this request. The president had the executive power to mobilize the Guard, but legally this method made them ineligible for duty outside the United States. At a conference later that day, the WPD suggested increasing the Regular Army to 530,000; Marshall argued this figure down to 400,000 a few days later. Most of the increase would go to completing the personnel of four Regular Army infantry divisions and the organization of two armored divisions. The chief of staff had reached the manpower figure that represented the highest numbers at which the Army could safely merge recruits into the divisions without severely diluting the trained Regulars. On June 13, WPD issued a report critical of Guard mobilization. Events in France outdated the document before it was printed. As France teetered on the brink of surrender, Marshall and the General Staff analyzed the danger to the Western Hemisphere. If France fell and the British Isles followed soon after, Hitler would gain access to shipbuilding facilities and many ships of two great maritime powers. The combination of real and potential naval and maritime power with possible territorial footholds within bombing range of American cities would turn the Atlantic Ocean into a platform for Axis aggression. At a June 17 General Staff meeting, Marshall and the staff agreed the time had come to federalize the Guard. The Guard divisions possessed ample supplies of old but serviceable equipment and enough manpower to make it “one of the few organized defense assets….” Each mobilizing Guard unit, however, would need a short, intense training period so it could aid the Regular Army in training new troops. The source of those new troops remained a major concern. After the Germans swept through France, the public mood began to favor an increased defense commitment. On June 7, the New York Times led the way, demanding a conscription bill. Thanks to Marshall’s foresight and General Palmer’s drafting committee, a written bill soon picked up bipartisan support and sponsors. With events speeding up, Marshall still acted as brakeman. Wary of instituting a draft that would dilute the existing Army, the chief of staff told a VFW convention on June 19 that the War Department planned to build the new army in a “step-by-step coordinated increase.” He warned against “an ill-considered, overnight expansion.“ Yet, Marshall also knew a draft utilized wisely could accomplish the same measured increase. During a Citizens Military Training Camp at Fort Dix, New Jersey, in May 1940, bare-chested U.S. Army recruits are lined up for processing. Within a year, National Guardsmen at Fort Dix and elsewhere were protesting the extension of their Army enlistments. Events in France and a political appointment in Washington soon shifted Marshall toward a pro-draft position. In an effort to gain bipartisan support for a third term, FDR announced two Republican cabinet appointments on June 20: newspaper publisher Frank Knox as Navy secretary and Henry L. Stimson as war secretary. Stimson, a member of the MTCA’s executive committee, favored the draft bill and let Marshall and the General Staff know he expected their support. With the admonition of the new War Secretary and the humiliating French surrender in the railway car at Compiegne, Marshall’s last reservations about the draft vanished. In a joint statement, Marshall and Admiral Harold Stark, chief of naval operations, recommend to the president a total mobilization of the nation’s defenses. The chief of staff threw himself into the battle to pass both the draft bill, known as Burke-Wadsworth, and Guard federalization, labeled Senate Joint Resolution (SJR) 286. Marshall went back and forth between the two houses of Congress stressing the “time of peril” theme and the need for quick action. ”Time is of the essence … the concerted effort of our whole national life is required.” By August, Marshall no longer had to sell the draft but rather to speed passage because the shaken American public favored Burke-Wadsworth. One nationwide poll showed 71 percent favored the first peacetime draft in American history. The congressional isolationists were determined to deny FDR a blank check for a new AEF. SJR 286 passed both houses and became Public Resolution Number 96 with the president’s signature on August 27. The resolution gave the president the power to order the Guard and reserve components to active service, but for no more than one year. On August 31, 1940, the president issued Executive Order Number 8530 authorizing the induction of designated Guard units in successive increments until all units were federalized. There were 22 increments, beginning on September 16, 1940, and ending with the induction of Nevada’s lone unit on June 23, 1941. Meanwhile, the Senate passed Burke-Wadsworth by a vote of 58-31, and the bill moved to the House. FDR awaited the House vote before calling out the Guard. After a two-week debate, the House passed the bill 232-124 on September 14, 1940. The new law declared “the national interest imperiled” and mandated conscription. The conscripts would “train and serve” for 12 months within the United States only. The draft was to supply 630,000 men in monthly increments for training and absorption into the Regular Army and National Guard units, so the new army could attain a total authorized strength of 1.4 million. On September 16, 1940, the first four National Guard divisions entered federal service, the 30th from the South, 41st from the West, the 44th from the Northeast, and the 45th from the Southwest. The War Department chose the divisions geographically to create minimal industrial disturbance. Guard mobilization averaged 50,000 per increment, or two to three divisions per month to keep down societal disruption and because the Army needed to build housing for the entire Guard. That evening, Marshall sat before radio microphones at WJSV, Washington D.C., and spoke on a nationwide broadcast. Eleven days later, Germany, Japan, and Italy signed the Tripartite Pact in Berlin. Within a few days of the October 16 registration day, 16,632,146 men between the ages of 18 and 36 registered with their local draft boards. At that time, the U.S. Navy disdained the draft, and the Army’s air and armored units required a three-year commitment, so the infantry would receive all the draftees. The law mandated that each draftee serve for one year from his reporting date. The draft law itself had an expiration date of May 15, 1945. The last two facts are crucial to understanding the “Extension Battle” during the summer of 1941. Yet, Marshall knew these citizen-soldiers trained for Western Hemisphere defense with a promised trip home after one year. The previous summer the Chief of Staff had favored an 18-month term, but others in the War Department believed war would come to America before autumn 1941. Nonetheless, the law did contain a clause that allowed extending the term of service. In early March, both the New York Times and Washington Post printed reports of War Department plans to extend service time. The War Department denied the report; however, as early as February the General Staff was prepared to recommend retaining the National Guard in service but deferred to the president. FDR, ducking warmongering charges from isolationists, remained mum. With the president publicly uncommitted, the War Department’s official stance remained one year of service. By April 1941, Army ground forces comprised 470,000 Regulars (three-year enlistments), 267,000 National Guardsmen (one-year service from mobilization date), and 413,000 draftees (one-year service from induction date). That month Marshall told the Senate Appropriations Committee to expect the first increment of National Guard divisions to demobilize on September 15, 1941, followed by the first draftees in November. He qualified the statement by adding that the decision hinged on the ever-changing world situation. Privately, the chief of staff desperately wanted to keep all the citizen-soldiers in service, particularly the Guard units. Marshall hated to lose whole divisions of troops whose avocation as soldiers had turned, at least temporarily, into a vocation. While Marshall and the War Department hedged around the extension issue, Congress recoiled from it. The original legislation allowed extension “whenever the Congress has declared that the national interest is imperiled.” One congressman’s peril, however, might be another’s foreign fight. Even lawmakers favoring extension feared accusations of “breach of faith” from soldiers and their families. FDR set the stage for extension in a May 27 radio address. Roosevelt warned that any German landing on Greenland, Iceland, the Azores, or any Atlantic island threatened the hemisphere. Citing apprehension of future Axis moves, the President declared “an unlimited national emergency.” Yet, he refused to ask Congress for a service extension. Everything during the perilous year of 1941 came one cautious step at a time. On June 22, the War Department submitted its final report to the president recommending retention of the National Guard and all reservists. No mention was made of the selectees. Since the draftees were soldiers by force of law rather than choice, the War Department knew they must direct a special effort toward Congress. On that June 22, Hitler’s invasion of the Soviet Union changed the war’s equation. Many Americans believed the invasion granted the United States a reprieve, signaling the end of the crisis. Great Britain still stood, and Germany had a two-front war. Why, these Americans asked, should the government break its word to the servicemen? New draftees could replace the draftees on active duty, and the recruitment of more Regulars could replace the Guardsmen, they argued. Many others, however, believed the threat unchanged and even intensified. General George C. Marshall (left) and U.S. Representative Edward T. Taylor confer as they appear before Congress on November 27, 1939, to support funding requests on behalf of President Franklin D. Roosevelt. The president sought additional funding to augment the U.S. armed forces, and World War II in Europe was already under way. Marshall knew his army’s strength following nine months of mobilization amounted to slightly more troops than the combined armies of Holland and Belgium had at the time of their overwhelming defeat a year earlier. Yet, the general also knew these troops of 1941 were the leaders and instructors of a larger future army. Thus, Marshall regarded the new turn of events as an opportunity to further strengthen the nation’s defenses. Searching for the most effective means to impress upon Congress the vital necessity of extending the service time of all the citizen-soldiers, Marshall took the usually dry and lifeless Biennial Report of the Chief of Staff and worked the document into a first-class advertisement for the refurbished United States Army and his hope for a continuation of this trend. The Biennial Report, presented on July 3, cited the Army’s growth from unpreparedness to an adequate defensive force, poised for more ambitious goals. The report revealed a predominantly citizen-soldier army; even the Regular Army divisions employed 75 to 95 percent reserve officers. In the ranks, draftees constituted one-quarter to one-half of all but two Regular Army divisions. Almost 10 percent of most National Guard division officers were reservists, and some Guard divisions had as many as half their enlisted strength made up of draftees. Marshall, trying to save all his new soldiers, remarked that even if the Guard stayed and the draftees and reserves went home, the National Guard divisions would suffer because of the intermingling of citizen-soldiers. Conversely, if the National Guard divisions demobilized, the non-Guardsmen would be orphaned if they had started their one-year service after their National Guard unit mobilized. The chief of staff’s report concluded with a warning. The nation faced a grave national emergency, and Army training must continue in the “most efficient manner.” The question of war or peace did not matter, for war might come suddenly and violently. The Army must be prepared. Marshall “urgently recommended that authority be given to the War Department to extend service for the conscripts, Organized Reserves, and the National Guard.” The Senate Committee agreed and proposed Senate Joint Resolution (SJR) 92, removing the restrictions on selectees’ length of service, and SJR 93, retaining the Guard and Reserves. With congressional battle lines drawn, one 40-year Capitol Hill veteran reported never having seen such fear of legislation. With the political forces arrayed, some experts predicted a five to one defeat. The White House prudently sent its point man, General Marshall, to the July 17 Senate Military Affairs Committee Meeting. The president hoped the great respect the senators of both parties held for Marshall would help carry the day. At that hot and muggy Senate Military Affairs Committee meeting, Marshall prepared to give his last and best shot at saving as many citizen soldiers as possible. A hush fell over the committee room when the stern, self-confident Chief of Staff began his appeal. Marshall told the lawmakers that the army had grown to almost a million and half men, most of them citizen-soldiers. If the extension passed, the chief of staff would request no more than 150,000 new conscripts. Further inductions, Marshall assured the committee, would be unnecessary unless events decreed otherwise. Allowing the first draftees to go home in November would require higher call-ups of new selectees. Marshall needed to keep the trained men. The general then intensified his argument by including the rest of the citizen-soldiers. ORC men filled key posts in all the Regular Army and National Guard divisions. Eighty percent of the new armored divisions’ officers were ORC men. The possible disintegration of these units and the loss of entire National Guard divisions would leave gaping holes in the fledgling army. Overall, the chief of staff’s presentation was effective and well received. Weighing the political situation over the weekend following Marshall’s Thursday testimony, the White House released a statement on Monday, July 21, that threw the president’s weight behind the extension. Others testified in favor, including Director of Selective Service General Lewis Hershey, Secretary Stimson, and General Williams of the National Guard Bureau. The Army expected opposition from the usual isolationists and anti-war groups; what the Army did not expect was a mini-mutiny. The mutiny started at Fort Dix, New Jersey, and made the New York Times on the same day as Marshall’s testimony. Companies I and L of the 174th Infantry Regiment, 44th Infantry Division, a western New York National Guard outfit, protested the extension proposal by sending telegrams to Montana’s isolationist Senator Burton K. Wheeler. Soon many other citizen-soldiers in camp chose the soldier’s ancient prerogative, griping. Letters and telegrams poured into the nation’s capital from draftees, Guardsmen, and reservists. The citizen-soldiers balked at undeclared war in peacetime. The men’s chief source of discontent was that extension forced them to serve overtime; others back home had not served any time. A new piece of graffiti began appearing on tanks, trucks, and latrine walls, particularly around the National Guard divisions set to go home in the fall—OHIO (Over the Hill In October). Quickly the press descended on the nation’s Army camps. A Life magazine correspondent interviewed 400 privates in one National Guard division and found plenty of vitriol. One corporal complained, “So Roosevelt will get our jobs back? The hell he will! I’ve already been told that I can’t have my job back.” Other gripes included general indecision and vague goals due to lack of immediate danger, antiquated or nonexistent equipment, lack of promotion, and, most irksome, “equality of sacrifice” between civilians and soldiers. The “defense economy” boomed while the privates made only $21 a month. The most significant political problem remained the nation’s indecision regarding the degree of danger. Drifting between isolation and intervention, neither Congress nor the president would take the lead. The men of the new army were first caught in the draft and then caught in the drift. Should the men train for offensive or defensive warfare? The political battle reached its climax in early August. Legislative leaders in the House favored extending the National Guard units and the ORC but felt bound by their previous statements opposing extension for selective servicemen. Nonetheless, the leaders believed the situation might conclude favorably if the president exerted his influence. Therefore, FDR sent a message to Congress backing extension for all and warning that the nation’s peril was “infinitely greater” than it was in the previous summer. Roosevelt then employed his most effective tactic, a national radio address. In his familiar, soothing yet forceful voice, the president reviewed the Nazi march of conquest, reiterated the national peril, and reminded his listeners of the nation’s duty to defend the entire Western Hemisphere. Public opinion remained divided, but the polls revealed a little over half the respondents favored extension. Declaring the national security imperiled, the Senate Military Affairs Committee pushed the debate onto the Senate floor. The committee recommended extension and abolishing all limits on the maximum number of draftees. The sweltering Washington heat may have encouraged compromise. The administration dropped its demand for an extension “for the duration of the emergency” after Senator Taft agreed to drop his four-month extension proposal. After tacking on a pay raise for the current selectees, the Senate passed the bill on August 7, 1941, by a 45-30 vote. The bill’s fate in the House, however, remained less certain. On August 12, the day of the extension bill’s crucial House vote, the German Army reached Odessa on the Black Sea, and Roosevelt met Churchill at Placentia Bay, Newfoundland. Their resulting meeting produced the framework of the Atlantic Charter. Events were clarifying the blurry lines of FDR’s “short of war” policy. The House of Representatives aided the clarification, but by only a hair’s breadth. With the bitter extension debate still echoing through the chambers, the House took its vote, 203 to 202 to extend. On October 29, 1940, the first drawing for draftees under the Selective Training and Service Act took place. The first peacetime draft in U.S. history was scheduled following the passage of the landmark legislation the previous month. 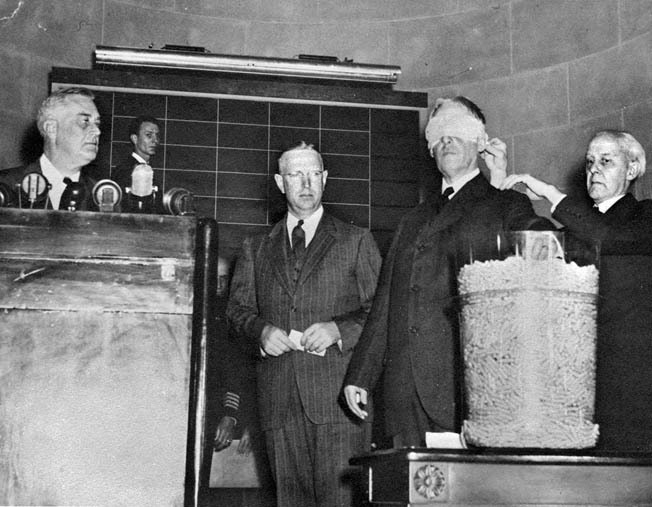 Blindfolded Secretary of War Henry L. Stimson picks the first draft number as President Franklin D. Roosevelt (left) looks on. The new law authorized the president to extend the period of service beyond the original 12 months “but not to exceed 18 months in the aggregate“ and suspended the limit on the number of men that could be drafted. Although Marshall and the War Department predicted the Army’s disintegration if extension failed, they were practicing what we now term “spin.” In hindsight, the situation seems far less damaging than disintegration, though still less than healthy for the Army’s effectiveness. Historian James A. Huston described failure to pass as “a significant dislocation in the Army’s mobilization, but it would not have been as serious as all that.” Only half the Reserve officers had been tapped during the year, and Marshall would have called up the other half. If the one-year draftees had gone home, they would have left as they arrived in timed increments, their places taken by new draftees. Contrary to popular myth, the Selective Service law was never the subject of extension, only the length of service time. Furthermore, the first draft call-up in November 1940 amounted to only 13,806, and the December figure 5,521. Had the extension failed, the draftees released by December 7 would have been negligible and all would have been called back following that transformative date, when all-out war changed everything. The real trauma for Marshall and the Defense Army would have been the Guard loss. Even though deactivation would have been incremental (nine divisions deactivated by December 7), there were no more National Guard divisions to activate. In actual numbers, higher draft calls could have replaced the lost Guardsmen. Nevertheless, the Guard’s training, experience, and cohesive unit structure would have gone with them. From his vantage point in the summer of 1941, Marshall knew that without extension or a declaration of war the loss of the National Guard divisions meant that by late summer 1942 those 18 divisions would have to be replaced by 18 new divisions of draftees and cadre Regulars to maintain the same strength. The strain on the Regulars would have been tremendous. In retrospect, the possible loss of the National Guard divisions proved the citizen-soldier’s importance to the nation’s defense in that perilous year. More significantly, all the contentious events during the summer of 1941 emphasized the necessity for a democracy, relying on such soldiers, to arrive at a majority consensus of how to employ those soldiers and for what purpose. The Regulars must be where they are needed for as long as they are needed without question. But the participation of citizen-soldiers on active service, whether for war or long-term emergency defense, requires strong moral and political backing from the people and their leaders. Tags Admiral Harold Stark, Adolf Hitler, Allies, American Expeditionary Force, Atlantic Charter, Axis, Blitzkrieg, Frank Knox, Franklin D. Roosevelt, General George C. Marshall, Henry Morgenthau, Japan, Japanese, John J Pershing, national guard, Organized Reserve, Regular Army, Selective Service Act, Sitzkrieg, Tripartite Pact, U.S. Army, U.S. Army Air Corps, U.S. Navy, virginia military institute, Winston Churchill.